Where Do I Sign Up To Be A Micro Celebrity? This week’s topic of “All That Tweets” covered the use of Twitter as well as micro-celebrities and online personas. I had a conversation in my room with myself (or my cat if you decide he counts as he was on my lap the whole time) about the lecture and tutorial material to attempt to make sense of it all. For week 9 “Craft and Digital Making”, my tutor asked us to find an example of a text being transformed by a media technology and relate it back to animation. Here is my Soundcloud podcast on the upcoming augmented reality game “Night Terrors”. To donate to get this awesome game made, click here. Transmedia storytelling is the telling of different stories over multiple platforms that all make up and add to one main story. I made a (really bad) Youtube video explaining what transmedia is by using the example of the Resident Evil series. It began as a survivalist horror video game about zombies and mutants and is now a collection of (pretty bad) Hollywood movies, spin-off books, prequel stories, sequel stories and alternate timelines which are explored through a range of different platforms, including comic books and radio shows. Resident Evil encompasses many of the factors of transmedia as described by Henry Jenkins. Take a look at the number of songs he samples on his album “All Day” while having a listen to a track from the album and seeing how many songs you recognize. I am going to admit it. I am biased against Apple. I have an Android phone and a Microsoft computer. I’m in the market for a tablet, and am desperately trying to justify a Surface Pro or even a new Chromebook to avoid succumbing to a dreaded iPad or Macbook. Glancing over lecture theatres, it’s crazy to see all of the little lit up apples around the room. Even in my tutorial today, over 80% of the room had an iPhone. I am a lone robot in a room of apples. Looking at this information, it surprised me to learn that Android is outselling Apple in telecommunications. My biased opinion made me think “well of course, it is the superior product”. What I hadn’t thought of was why. Why did I think Android or anything not-Apple was better. After the lecture, I realised it was because I disagreed with the close-platform approach that Apple takes with its products. How platforms are created is an ideological choice. Apple has created a closed-platform device that comes with everything included. This gives Apple complete control over the device, content and ultimately the user. Apple products are pretty, easy to use, highly maintained, reliable and the users are comfortable with the hardware and software. Android phones are an open platform, where everything is customizable – anyone can access and modify the code if they know what they are doing. Android has limited control over their devices, content and users once it has passed into the hands of the user. The ideology behind this is aimed at connectivity verses control. As was stressed in the lecture, being an open or closed platform doesn’t make something better or worse. In my eyes, open is better, but I can acknowledge that both have their own benefits and disadvantages. When copyright was first introduced in 1710 to stop book piracy, it was labelled the “Act of Encouragement of Learning” to give off the impression that it was being created to protect the work of creators. 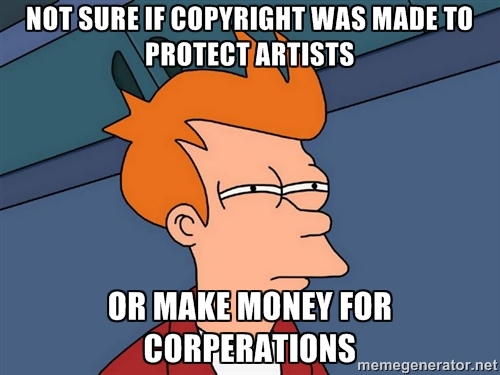 Today, copyright is still considered to be protecting artists. You can’t take anything that isn’t in the public domain and make something with it or you are breaking the law. In terms of creative content, there are four major companies that own pretty much everything; Disney, Time-Warner, Viacom and Newscorp. Disney is the reason that the copyright extension act was created , because they wanted to protect their character Mickey Mouse from becoming available in the public domain. When you look at how the big corporations treat copyright laws, you could speculate that they are not as interested in protecting their creative ideas, content and protecting artists as they are with making lots and lots of money.